Pictured from left to right are: Nathaniel Jacobsen, Payton Kurosz, Makayla Palmer, Alexandra Bacany, Rylie and Drew Wiegand, and Faith and Courtney Petersen. 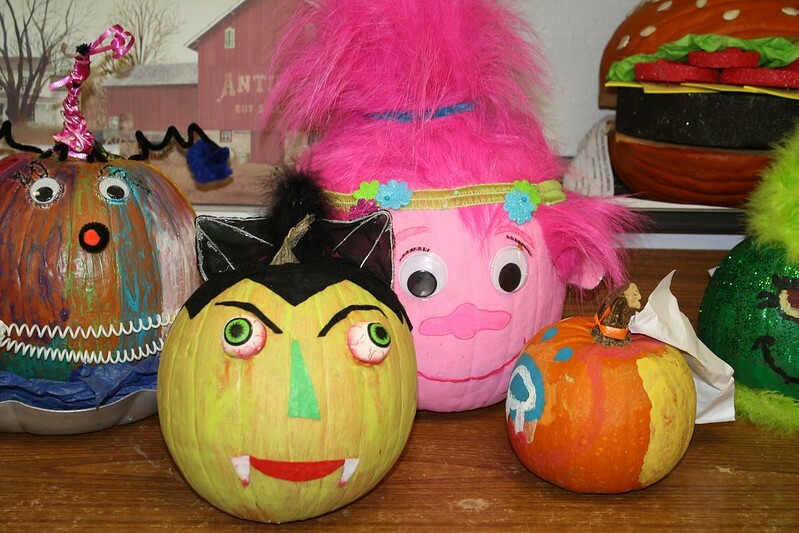 Moriches Elementary School art teacher Linda Tucci has once again hosted the 37th annual “Great Pumpkin Contest,” in which students and their families were invited to create an original sculptural pumpkin using any materials and techniques they could incorporate. This contest encouraged family members to work together collaboratively, and supported the ELA Standards and Standards for the Visual Arts in our schools. Guest judge Anissa Ferreri with art teacher Linda Tucci. There were 16 faculty and staff judges, as well as a guest judge, Anissa Ferreri, a senior enrolled in the Floyd Academy who attended elementary school at Moriches. Anissa is interested in possibly pursuing a career in the arts; and after serving as a guest judge, she visited some of her former teachers and classrooms. Judging was based on creativity of materials, originality and neatness. Congratulations to the following winning entries: “The Puffer/Blowfish” by Alexandra Bacany and family, First Place; “The Hamburger” by Drew and Rylie Wiegand and family, Second Place; “The Large Poppin’ Popcorn” by Nathaniel Jacobsen and family, Third Place; and three Honorable Mention awards: “The Pink Troll” by Payton Kurosz and family; “The Wicked Witch” by Makayla Palmer and family; and “Frankenstein” by Courtney and Faith Petersen and family. Click below to see more pumpkins!